Ten shortlisted projects announced for Watershed's £30,000 Playable City Award, aimed at artists working with technology. 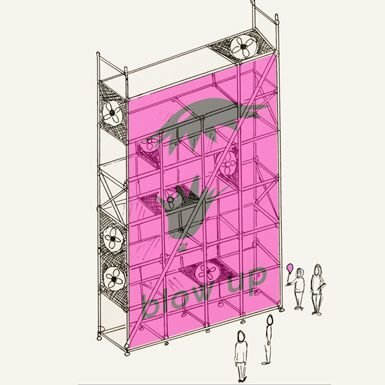 Digital birds, 3-D body scanning booths, crowd-controlled balloons and a GPS-enabled umbrella – all these ideas and more are featured in the ten shortlisted projects for a new award aimed at artists working with technology. The Playable City Award, an initiative produced by Watershed, Bristol, is offering £30,000 to the eventual winner, who will be commissioned to complete their idea in time for a summer 2013 launch, before the work is then toured internationally. The judging panel – Tom Uglow, Creative Director of Creative Google Labs in Sydney; Imogen Heap, musician; and Claire Doherty, Director of Bristol-based art commissioning organisation Situations – will meet to discuss the shortlist on 14 January 2013 and the winner will be announced on 21 January. The Arc Project (Ivana Basic, Kyle Macondald, Gabriella Levine, Jack Kalish), New York: 3-D scanning booths with special viewing bubbles. Baloonometer (Ludic Rooms with Talking Birds and Splash and Ripple), Coventry: Crowd-controlled installation using balloons, microphones and fans. Cast (Nicky Kirk and Ed Carter), London, UK: Site-specific interactive pavilion and immersive environment. The City You Dreamed Of (Laura Kriefman), Bristol: Building blocks with embedded sensors tumbling out of a tip-up truck touring the city. Hello Lamp Post! (PAN with Gyorgyi Galik and Tom Artmitage), London: A city-wide conversation taking place through street furniture. Interactive Album (Fred Deakin), London: An album as a series of installation experiences in locations around the city. Jolly Brolly Mystery (Andrea Hasselager and Rune K. Drewsen), Copenhagen: City-wide clues on rainy days and a GPS-enabled umbrella. Playscape (Hide&Seek), London: Public digital displays that provide free public play. Robot Runners (Seb Lee-Delisle), Brighton: A massive city-centre spectacle involving up to 100 robots. Sing A Little Song (Lucky Frame), Edinburgh: Digital, wirelessly-connected birds installed around the city. View an overview of the shortlist here.